Given the popularity of the Star Wars franchise, it's no surprise the Origami Yoda book series is so well-liked. The books combine some of the most memorable Star Wars characters with the art of origami to create unique and fun stories. 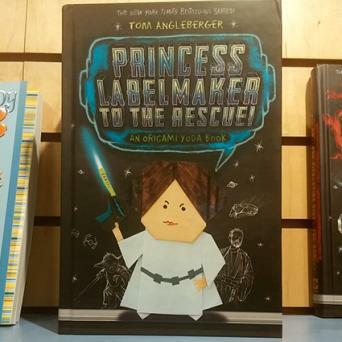 The Origami Yoda books are written by Tom Angleberger and published by Amulet Books. On his website, Angleberger says it was seeing Fukiami Kawahata's origami Yoda which inspired him to write the books. After failing to master Kawahata's origami Yoda, Angleberger created a new version which led to his writing the first book. There are seven books in the Origami Yoda series. The books are for kids ages eight to twelve. Dwight is considered the odd man out in his sixth grade class so when he creates an origami Yoda finger puppet, his classmates aren't surprised. However, when the puppet predicts events and dates and hands out wise advice, people wonder if it has mystical powers. This book was published in March, 2010 and is the first book in the series. You can buy the paperback version of the book on Amazon for $7.95. Dwight's number one enemy, Harvy, gets him suspended and Origami Yoda sets out to clear his name. Howevr, Harvey creates Origami Darth Vader to help make Dwight's suspension permanent. This book was published in August, 2011 and is the second in the series. Buy it on Amazon for $11.68. Book three in the series was published in August, 2012. The book has Dwight attending a new school, leaving his former classmates to navigate the twists and turns of middle school without the advice of Origami Yoda. When an origami Chewbacca fortune-teller turns up, he steps in to give advice in Yoda's place. Barnes and Noble sells the book for $10.96. Angleberger created this book to help fans learn to create origami versions of popular Star Wars characters including Yoda, Darth Vader, R2-D2, C-3PO and Jabba. The book was published in March, 2013 and includes two Star Wars backdrops for photographing, instructions and ten pages of origami paper. You can purchase the book at Barnes and Noble for $9.50. After returning to his original middle school, Dwight and his classmates are challenged by a new educational program meant to increase test scores. They turn to Origami Yoda for advice but he's unable to solve the problem alone. Along with students, he forms a Rebel Alliance which unites in the face of an unexpected attack from Jabba the Puppet. This is the fourth book in the series and was published in August, 2013. The book costs $10.56 on Amazon. As students continue to fight the standardized test battle and save their field trip, they seek a new emissary, their principal. The mysterious Origami Princess Labelmaker steps in to convince the principal to fight on the rebel side. This book was published in March, 2014 and is the fifth in the series. You can find the book at Target for $10.55. 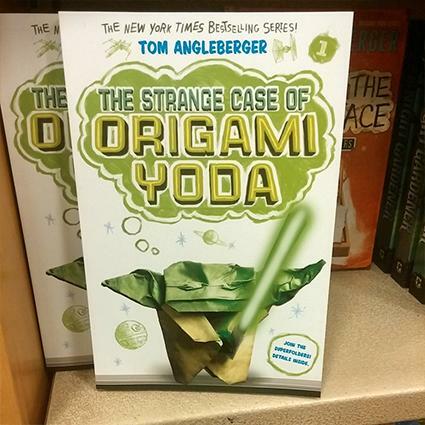 This is the final book in the Origami Yoda series. As students get ready for their hard won field trip, their principal announces the trip must be "origami-free." Dwight secretly creates an Origami Yoda from a fruit roll-up but Harvey fights back by creating Origami Emperor Pickletine. A battle and series of misadventures between the forces of light and darkness ensues. Published in August, 2014, Target sells the book for $13.95. The Origami Yoda book series is on its way to being as epic as the Star Wars movies. The books tackle middle school issues in a clever and fun way. With each book offering instructions on how to create origami characters, the series is the perfect infusion of literacy and crafts. To learn more about the series, check out the author's website.